Our lives are variable and don't always follow a schedule, but auto-away features are unreliable. Skylark provides reliable location-awareness to your smart thermostat using battery-conserving geofencing technology. It installs in minutes, and helps you lower your energy bills. 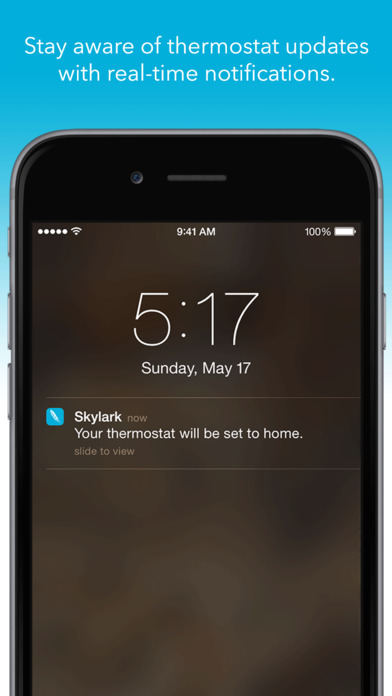 Skylark intelligently takes care of the details of managing your smart thermostat. Your home will always be comfortable when you come home, and conserving energy when you're away. Remote worker? Student? Stay-at-home parent? No need to adjust your thermostat's schedule when your plans change. Leaving the furnace or AC on, or waiting for auto-away to activate even once or twice can be costly. Skylark quickly pays for itself by eliminating waste. With Skylark, your Nest thermostat automatically toggles between Home/Away modes as you come and go - so you'll never need to remember it yourself. Connect Skylark to your wifi-enabled Honeywell thermostat to automatically activate your Hold temperature range as you approach your home. It'll feel just right when you come home. Skylark integrates with the IFTTT realtime API. Automatically adjust your lights, create Slack notifications, and automate your smart home based on your location, with Skylark. Sign up with your email address to receive product news and promotions!